This past weekend we celebrated my daughter's birthday with a family party/picnic. She has been quite taken by the Mr. Men and Little Miss book collection by Roger Hargreaves. 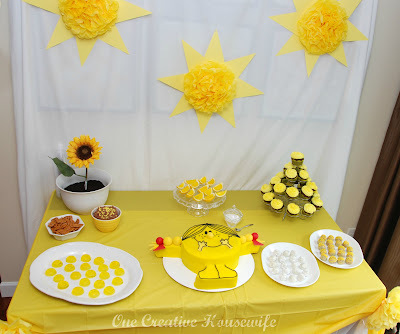 My daughter absolutely adores everything Little Miss Sunshine, so that is the direction we went with her birthday party. The decorations for the party were super simple. 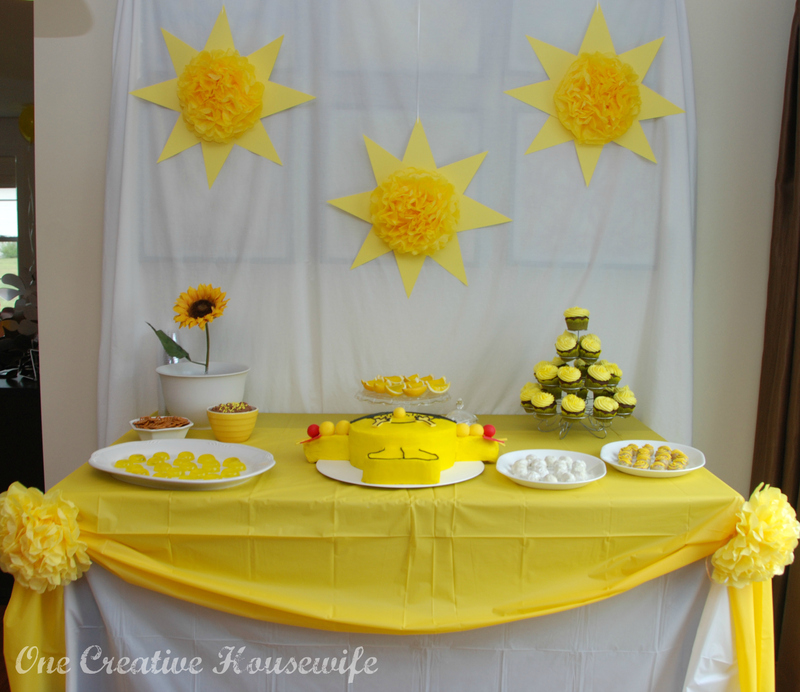 To dress the dessert table I just swagged a plastic yellow table cloth over a white one, and tied the ends up with some tissue paper pompoms I made. For the backdrop, I placed a white flat sheet over the pictures I have on the wall and hung 3 "suns" made of card stock and more tissue paper pompoms. 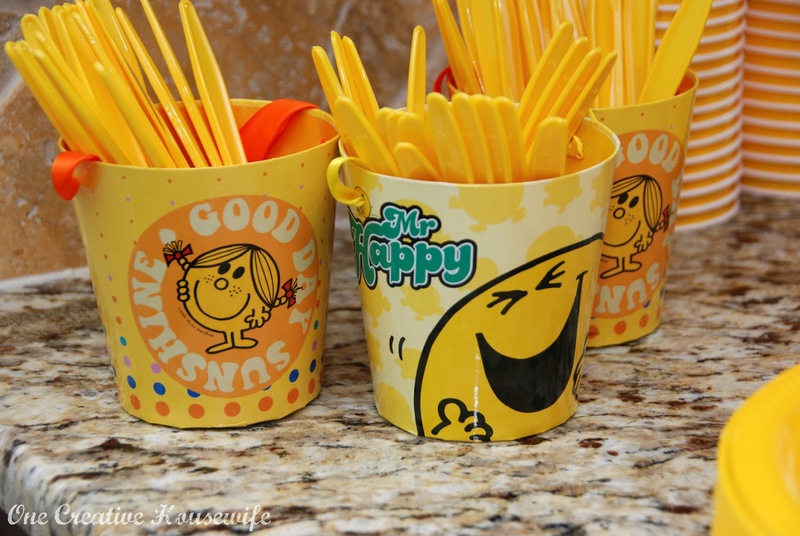 We stuck with a basic yellow theme for all our plastic ware. I found these adorable buckets in the Target dollar section, to display the plastic ware in. For the favors I hit up the Target dollar section. 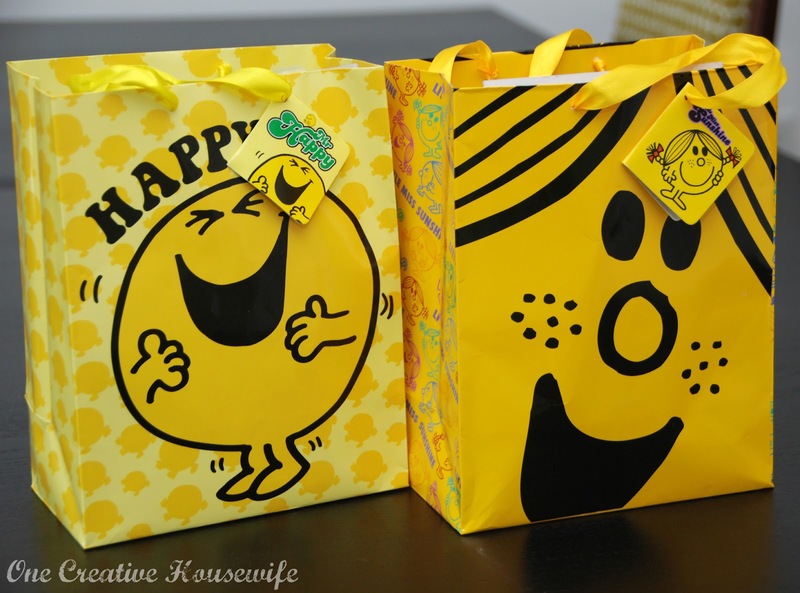 The favor bags contained Little Miss and Mr. Men notebooks, pens, and stickers. They also had fruit snacks, sunglasses, a playdough set, a party blower, and glow-in-the-dark sticky hand (to represent Mr. Tickle). Due to the fact that there was a threat of rain and we had planned an outside party, I had to come up with a quick centerpiece for tables indoors. 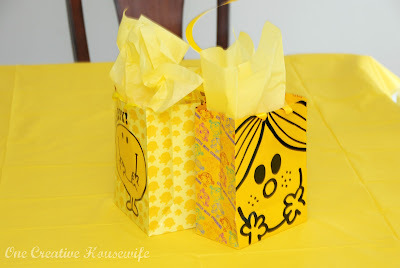 I just used 3 favor bags per table to make a triangle on each table and added some yellow tissue paper to the bags. Thankfully, it ended up not raining and we had a beautiful day! The kids played outside for most of the day. 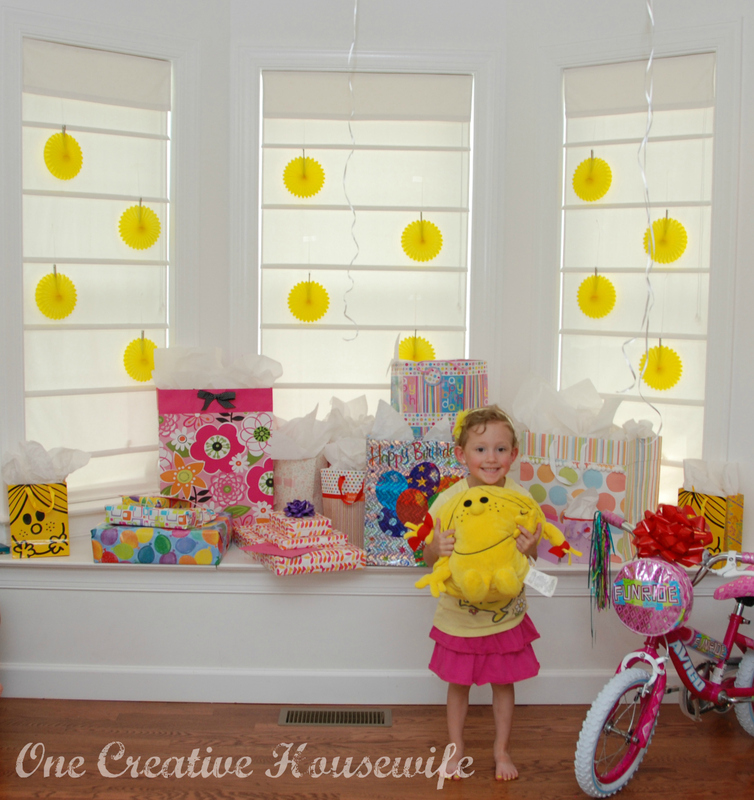 (Which explains my daughter looking like a hot mess in the following picture...lol) Behind the gifts I hung little yellow tissue fans, and we filled the family room with yellow helium filled balloons. Tomorrow I will share a little more about the food we had for the party. So cute! I love love love the bright yellow! So happy! I am using that same theme for my daughters first birthday. I went looking for those bags and cups and could not locate them at my Target. Do you still have yours? If so, Are you willing to sell them? I'm sorry I don't have the bags any more. 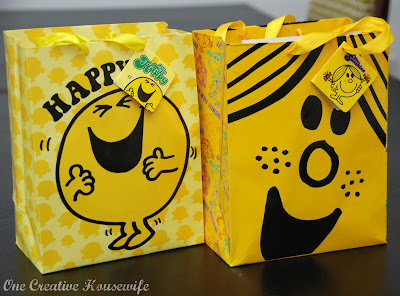 I let the kids take the bags home with their favors. As for the cups my kids have been playing with them ever since the party and they really aren't in good condition any more. If I happen to come across any that haven't been damaged I will let you know, and if I see any at my Targets I will pick them up for you. Thank you so much for replying!!! I greatly appreciate it!!! No problem, I put the word out to my other Target lovin' friends to keep an eye out for the Little Miss Sunshine stuff. I really appreciate you stopping by!